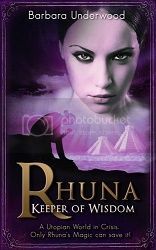 Barbara Underwood marks her debut in the world of fantasy fiction with the spellbinding novel, “Rhuna, Keeper of Wisdom” which follows the adventures of a young heroine with an extraordinary gift. It also features a cast of richly drawn characters and compelling storytelling that will rivet readers from beginning to end. The story is set in an idyllic utopian society, not unlike the Atlantis of myth, and follows the adventures of the title character, Rhuna. A series of extraordinary events unfold after the young girl discovers the startling truth about her father and the enemy that caused his demise known as The Dark Master. As Rhuna struggles with her newfound discovery, her beloved homeland is thrust into chaos, threatened by her father’s old nemesis. In the midst of the unfolding cataclysm, Rhuna must find her extraordinary destiny and the courage to stop The Dark Master from destroying everything and everyone that she loves. Suffused with magic and menace, “Rhuna, Keeper of Wisdom” will send readers on a journey to astonishing realms, as only the most exquisite kind of fiction can do. Fantastic world building and an intensely gripping plot draw you into this vividly penned novel from page one. Underwood easily & fully transports readers into the fantastic world that she's created, keeping them there. I couldn't put this novel down, dying to know what the next plot twist would bring; and believe me, there were many. Underwood's writing style also called to me. I love how she involves her audience in the story, leading them forward as if they're there alongside her, rather than simply telling them what happened to her characters. And the characters! Oh wow the characters! I loved the individuals that we met throughout this story. I couldn't get enough of them and was definitely sad to see them go at the end of the novel. They were so easy to get to know and to connect with. I felt as if I'd made friends, rather than simply reading a novel. This is definitely a novel that will be loved by readers of all ages. It's clean enough for a YA audience and exciting enough to grip adults and not let go. I know I sure couldn't put it down. Nor can I wait for the next novel in the series. It's cold here in my part of the UK! Looks like a great book, can't wait to check it out! Weather in my part of the world is getting cold but clear at the moment. Sounds like a fast-paced read! Thanks for the giveaway! Thanks so much for the fabulous review, Jonel!! THANK YOU AND LOOKING FORWARD TO READING YOUR BOOKS! Thanks. It's warm where I am. Love the review. Thank you for this wonderful opportunity, Barbara! It's a glorious sunny spring day here. The weather where I am starts out very chilly in the morning but then we reach a high of 80 degrees in the afternoon. It's cold in the morning here in western nebraska but the days are still on the warm side. It is always sunny in Karachi. Thanks for the giveaway! Looks like it will be a good read if Jonel's exuberant words are anything to go by. It is pretty seasonable here, in the mid 50s for highs. It's 81 degrees out currently with blue skies. Hi. The weather here is 68°f and I'm happy that it won't be too hot, the little rain here my city is getting is the next 3 days. I'm not ready for that but since it's going to be fall and all so i have to accept it lol. Sounds like great reading with a great giveaway to help purchase the book! Funny you should mention weather, I was just in Michigan and there were snowflakes! I'm home now and it is almost 80 degrees and sunny! There's no place like home! Good luck and thanks for the giveaway ! Giveaways are so exciting! It's chilly but colorful here in Indiana. Sounds great! I love fantasy books!